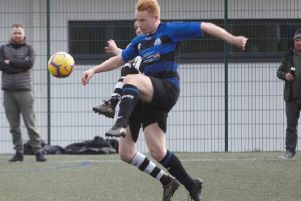 Ovenden WR maintained their recent improved form with a convincing 4-1 home victory over Toller FC in the West Riding County Amateur League. The next-to-bottom side had a much changed line-up from the previous week but Dan Wilzynski and Cameron Visciano were outstanding throughout at the heart of their defence. West Riding went a goal up on 10 minutes through Calum Blezard’s excellent strike after Wilzynski’s knock down. However, five minutes later Haroon Rasib headed Toller level from six yards out. West Riding continued to dominate and Jordan Pettifor’s 15-yarder soon made it 2-1. Just before the break Blezard netted his second from 12 yards. Toller threatened at the start of the second half but they were pegged back further when Andrew Mellad’s corner was swept home by Jamie Keegan. Brighouse Old Boys were beaten 7-0 at home by title-chasing Glasshoughton Rock in Division Two of the West Yorkshire League. Lucas Birts had a great chance to give them the lead but was unable to beat the ‘keeper and pacy Peter Kuleczko’s effort was heading for the corner of the net before an athletic save. Glasshoughton had taken the lead in between those attempts and added two more before the break in spite of defiant defending by Jordan Hadden, Graham Tait, Martin Newham and Nial Porter plus confident handling from keeper Alex Dyson. Any hopes Brighouse had of getting back into the game were shattered by a defensive mistake on the resumption and Glasshoughton then ran away with the contest.